After making Caprese Salad with my home made mozzarella, I still had about a third of the 250 grams of cheese left. There is no such thing as leftover cheese in this household and pizza is a surefire way to use up cheese. I always keep a packet of tortillas in the freezer and they’re great for pizza as you don’t need to defrost. Just start loading up with toppings and by the time you’re ready to pop into your pre-heated oven, they’re already defrosted. Four decent sized blobs of mozzarella dotted each of our four pizzas as well as prawn, capsicum, mushroom, onion, garlic, basil and tomato/mayo sauce. A perfect way to use fresh mozzarella. Yum. I love these kinds of quick meals. And it looks like every last bit of your mozz got used! Yes, every last bit. I especially enjoyed the rough torn use on the pizza. Must more rustic than grated. I like that. Who was the chef who said he prefers hand torn balls of mozz to shredded cheese? Might have been Nigel Slater? Don’t remember. Btw, forgot to mention that I love the labbit! My mozz doesn’t want to be shredded. I think it would be traumatised. Nigel Slater is a smart man. Did you notice that the labbit is Tofu coloured? I did 🙂 Did you pick that especially for that? I usually get the ones in boxes, so I have no idea which one it is till I get home! lol. We painted the labbit to be just like Tofu. He sat at the bridal table at our wedding so that Tofu could be there in spirit. Wow – looks delicious! What a great idea. Tortilla as a pizza base- I had not thought of that! Great idea! It’s very easy and quick too. 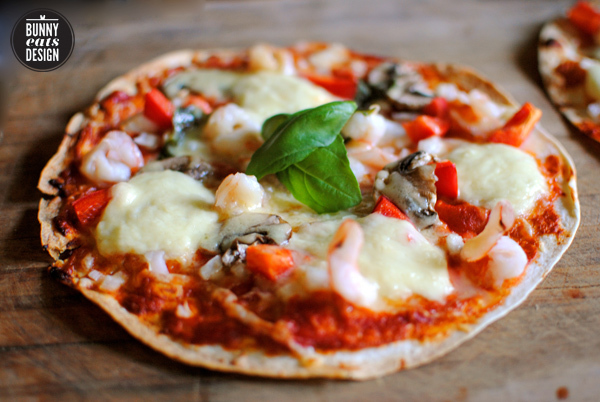 Such a great quick pizza, I’ve used the shells as well, I love how crispy they get. And home made mozerella sounds incredible! Great photography and great idea! I would definitely make pizzas more often if I had tortillas in the freezer! Food blogs in general are dangerous territory when you’re on a diet! If I feel like being healthy though, I buy lots of in season vegetables and then browse recipes on what to do with them. The more good ingredients per recipe, the more likely it will get used.